Orca Lodge is the product of the merger of two lodges, both of which have a long and colorful history. Mow-A-Toc Lodge 262 of the Redwood Area Council was first chartered in 1944 and hosted its first conclave in 1954 at Elk River Scout Camp. Cabrosha Lodge 537 was first chartered in 1959 and hosted its first conclave in 1967 at the City of Ukiah Municipal Park. In 1992, the Redwood Empire Council was formed from a merger of the Redwood Area Council and the Sonoma Mendocino Area Council. Two intense years of planning and organizing finally came to a close with the formation of Orca Lodge 194. Orca Lodge held its first Lodge Dinner in January of 1994. It is only fitting that 194 was granted as the Lodge's number, as it symbolizes the date (1/94) of the founding of the Lodge. The totem of the Lodge is that of the Killer whale, or Orca. Orca Lodge was initially comprised of two chapters, representing the two merged Lodges: the Cabrosha Chapter and the Mow-A-Toc Chapter. "The Orca Spouts" is the Lodge newsletter, and it conveys information to all of the members of the Lodge. With the dawning of the Internet age, Orca Lodge was one of the first in the nation to go online with a website in 1994. Since its beginning, Orca Lodge has been very active. In 1995 the Lodge sponsored a Council Camporee, as well as hosting the Section W3B Conclave at Two Rock Coast Guard Station. Orca Lodge was one of the few lodges to send members to the OA Philmont Trail Crew in 1995 and 1996. The lodge has sent a contingent to each NOAC since its start in 1994. 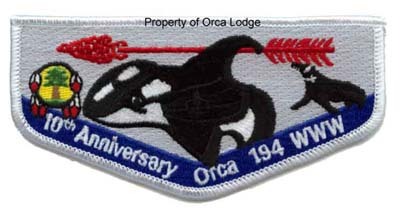 1998 saw the Orca Lodge send 22 members to the National Order of the Arrow Conference at Ames, Iowa--the most ever. Most recently, Orca Lodge sent 15 members, six of whom were on staff, to the 2002 NOAC at Indiana University. Orca Lodge is very proud to have been chosen to receive the E. Urner Goodman Camping Award for 1997, one of eight lodges nationwide. We were awarded this again in 2008 and 2009. In 1995, and again in 2001, Orca Lodge received the Bald Eagle Award, given to the lodge most active at the Section Conclave. At the 2002 NOAC, Orca Lodge also received the National Honor Award in both website and newsletter competitions. In 2008, we were awarded the National Service Award. Due to a Council realignment, our Mow-A-Toc chapter was reallocated to Lo La'Qam Geela Lodge in 2012. After the Lodge realignment, Orca Lodge was restructured into new Chapters to support the individual districts within Redwood Empire Council. The Lodge is very active in the Section and frequently has members elected to Section offices as well as supplying many of the Advisers. Orca Lodge has had a strong beginning and is looking forward to a mighty future.